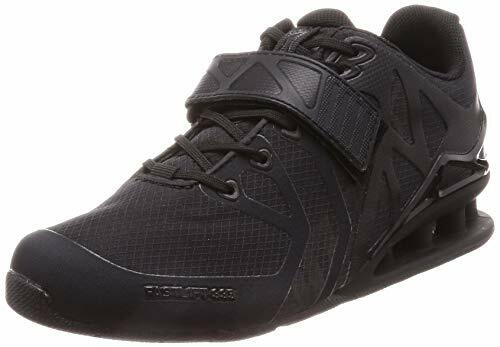 These imported shoes offer state-of-the-art technology for the knowledgeable fitness enthusiast, especially those focusing on weightlifting. They’re also an excellent choice for CrossFitters who incorporate running, climbing and jumping into their workout routines. Read on to find out what this fantastic cross-training product from Inov-8 has to offer a CrossFit athlete like you. SIZE NOTE - The shoes come up a 4 on our fit scale (1 narrow - 5 wide). A number of features make the Fastlift 335 an ideal shoe for weight training and lifting. The carefully structured heel and midfoot of the shoe gives you support and stability. The technology used in these shoes is called EHC and Power-Truss, and, like other patented Inov-8 features, they are made to be the best. Furthermore, these shoes have set a new standard for weightlifting shoes by being the lightest in their class. You get a lot of options when it comes to the color of these shoes. Once you put them on, you’ll find yourself getting a lot of compliments on how great they look. They add a light touch to your exercise apparel with their bright, cheerful appearance and are perfect for the fitness lover who also likes to have fun. Can I Use these Shoes for Running or CrossFit? A common question that people have is whether or not they can use the Inov 8 335’s for running or CrossFit workouts. Let’s find out! For running, these are not the ideal pair of shoes. They’re heavy on the support and stability, and have very minimal shock-absorption like you’d want for running. They’re also far too heavy to run effectively in. However, for a CrossFit workout, they may be a slightly better option. It mostly depends on what kind of workout you’re doing. For one that’s heavy on the lifting, they’ll do well and should be able to handle the warm-up, a few box jumps or rope climbs. However, if your workouts are heavier on the running and jumping, then you’ll probably want to consider something like the Nike Metcon 2 which is an all-round cross-trainer designed specifically for these types of workouts. When you first put these shoes on, they may feel a little too light with a little too much space. That feeling goes away once you get started with your workout. Then you realize that you no longer feel the extra space. There’s a reason why the Fastlift 335 has set a new record as far as weightlifting shoes are concerned: they are lighter than ever before. Used as you are to heavier models, the lack of weight does take a little getting used to. Once you become accustomed to it, however, you’ll find that they work better than anything you’ve ever had before. And they still offer a great level of support for when you’re doing your heaviest lift. In short, the Women’s Fastlift 335 is an excellent shoe for weightlifting, or general CrossFit activities. You can do a wide range of activities in them such as short sprints, lifting weights, rope climbing, jump rope and box jumping. They are a very nice shoe at an extremely reasonable price and they also have some excellent reviews on Amazon. What do you think about this top-quality lifting shoe from Inov-8? Leave a comment below and let us know what you think.